The project of Jesuit higher education requires growing and living in the words of Saint Ignatius, “Go and set the world on fire.” I was first introduced to the concept of an ‘honor society’ in 2002, when I had the opportunity to study at Marquette University thanks to a scholarship from ETEA. 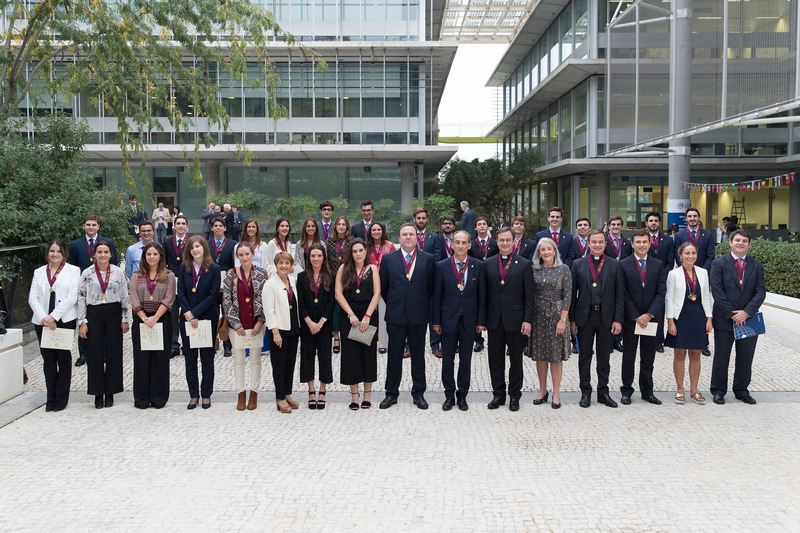 Honor societies are not common in Spain; I was impressed with how Alpha Sigma Nu creates connections with students, faculty, and alumni all around the world. Establishing a Chapter of Alpha Sigma Nu at Loyola Andalucia not only opens up an endless networking opportunity for students, but it creates a clearer Jesuit vision for our students. As Universidad Loyola Andalucia is a new university, it is important to build knowledge of and commitment to the values of Jesuit higher education. As our university grows, this Chapter will share the core values of scholarship, loyalty, and service with members and all students on our campuses. The AΣN Board and staff has a great vision for AΣN. We are met with Kate Gaertner many times as she outlined the ideas and the objectives of Alpha Sigma Nu, providing a great foundation for our Chapter. From the beginning, we have included our students in the AΣN discussion. We presented AΣN not only as an opportunity for leadership, but also as an opportunity for service. Loyola Andalucia students are very open to facing new challenges. Many are currently participating in a double degree program with Loyola University Chicago and others are participating in various study abroad programs around the world. The drive and motivation of our students is what has pushed the AΣN Chapter forward. They will collaborate with Campus Ministry and assist international students upon their arrival. All students, at our campuses in Sevilla and Cordoba, will better understand the values of Jesuit education thanks to the action of this new Chapter. And when they study abroad, they will be AΣN ambassadors at schools across Europe, Asia, Central America, and South America. For a new AΣN Chapter to be successful, university leadership and students must be committed. As Loyola Andalucia is the first Spanish speaking chapter and the first European chapter, we are in a position to be the bridge to AΣN for new international Chapters. We see it as a fantastic opportunity to take part in the creation of an international AΣN network, following the directive of Father General Adolfo Nicolas to build and utilize Jesuit networks. AΣN has a unique vision of Jesuit networking, promoting the collaboration among members and increasing the connections between Jesuits institutions of higher education internationally. As Loyola Andalucia is the first Spanish-speaking Chapter and the first European Chapter, we are in a position to be the bridge to AΣN for new international Chapters. The administration of Universidad Loyola Andalucia, including Director of Campus Ministry Maria Rita Martín Artacho (Loyola Andalucia ’16), General Secretary Pedro Pablo Pérez Hernández (Loyola Andalucia ’16), and Rector/President Gabriel María Pérez Alcalá (Loyola Andalucia ’16) embrace the vision and purpose of the Society and see the positive impact this new Chapter will have on our students. We have received tremendous encouragement in this effort from across the ocean from Michael Garanzini, SJ (Saint Louis ‘71), Chancellor of Loyola University Chicago and Secretary for Higher Education, and Michael Sheeran, SJ (Regis ‘76), AJCU President. Advice on Chapter formation from Thomas Regan, SJ (Fairfield ‘84) Loyola Chicago AΣN Faculty Adviser, the importance of AΣN to a campus from Daniel Hendrickson, SJ (Marquette ‘13), President of Creighton University, and suggestions on forming a Spain Chapter from Scott Hendrickson, SJ (Loyola Andalucia ’16) have given us great direction in how to infuse AΣN throughout the University. Here at Universidad Loyola Andalucia, we try to live by St. Ignatius’ challenge, “To give without counting the cost.” By investing in our students, we know that we are creating learning opportunities that will have a great impact on their lives. When our students complete their education, we hope they inspire future students with their drive and commitment to live the values of the Society of Jesus and “to go forth and set the world on fire”. 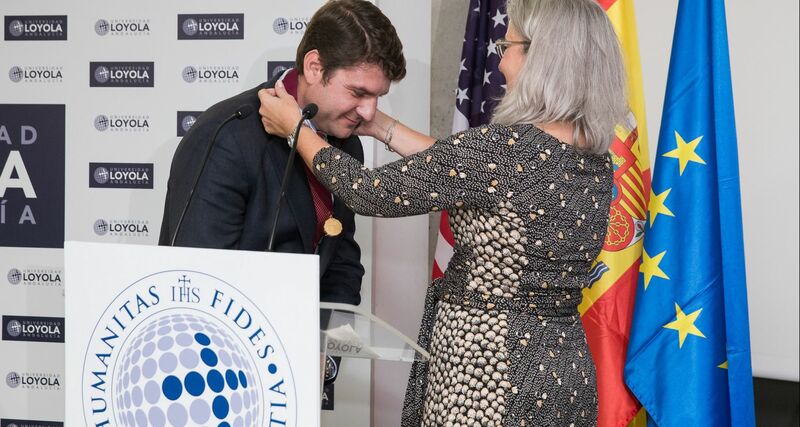 Francisco de Borja Martín Garrido (Loyola Andalucia ’16), is the Director of International Relations at Universidad Loyola Andalucia. This article and more can be found in the winter 2016 Alpha Sigma Nu newsletter. Read it online!